The Oxford to Cambridge Expressway will follow the new East West Rail link, to offer better connectivity and encourage more people to travel by train, ministers have said. Roads minister Jesse Norman announced that the Government has chosen the central corridor (Corridor B) for the new road, which aims to fill '30-mile gap in the network' between the M1 at Milton Keynes and the M40 at Oxford, after detailed scrutiny and review by Highways England. The Department for Transport said that Corridor B ‘was judged to offer greater benefits to the region – outperforming the other options by providing better links to jobs, education, leisure and health services’. Officials said building the new link close to the East West Rail link will also offer more options for the commercial development of up to a million new homes, in line with proposals by the National Infrastructure Commission, ‘and encourage more people to travel by train rather than by cars’. Mr Norman said: ‘The Government is taking the big decisions on infrastructure, working to maximise growth and productivity across the UK. ‘England’s economic heartland, as it has been called, already plays a crucial role in powering the UK’s growth, science and innovation, but there is no single route to connect Oxford and Cambridge. Mr Norman said the expressway, which is due to open in 2030, is also expected to take up to 40 minutes off the journey between the A34 south of Oxford and the M1. 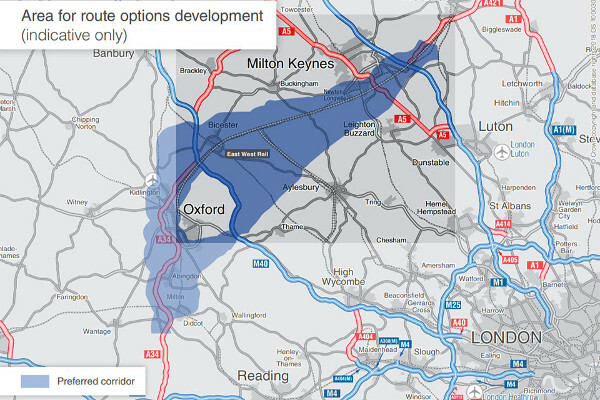 The selection of the central corridor nevertheless leaves open the option of passing either west or east of Oxford. Despite the claim that the route would encourage rail travel, the Campaign for Better Transport called the decision ‘a backward step, undermining the sustainable transport policies that should be at the heart of the Government's Clean Growth plans’. A public consultation will be held next year, before a preferred route announcement in 2020, with construction due to start in 2025.